Leigh Community Art Group: Opening Night Of Leigh Community Art Group's Annual Exhibition 2013, A Great Success! Opening Night Of Leigh Community Art Group's Annual Exhibition 2013, A Great Success! Wednesday 3 July marked the opening of Leigh Community Art Group's "Annual Exhibition and Sale of Paintings 2013" in the Derby Rooms, Leigh Library. 270 works were on display, in a variety of media, by over 20 club members. 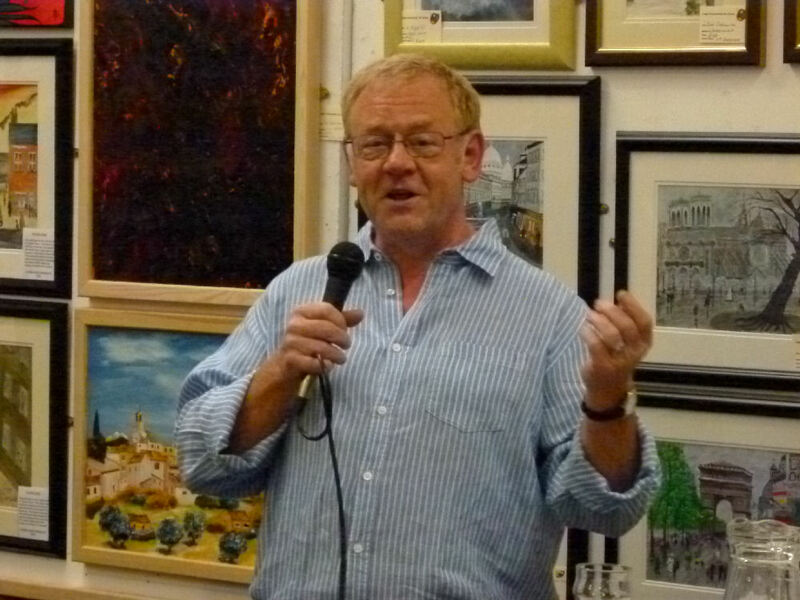 Proceedings were opened by Allan Beswick from BBC Radio Manchester. Allan gave a very interesting and humorous insight into the hazards of shopping abroad when lacking in language skills. His anecdote concerned the results of mistakenly buying yeast instead of cheese! Allan noted this was his 10th time of opening the event which like all the others was a great success. Over 200 invited guests dragged themselves away from Andy Murray to enjoy the sale of works with a social dimension including complimentary wine and buffet. 32 paintings were sold on the night and these have been replaced. The exhibition runs until Friday 2 August 2013 and admission is free. The club meets most Mondays in the Leigh Harriers' Lounge, Leigh Sports Village between 18.30 and 20.30. New members are always very welcome. For further details visit the club blog at www.lcag.blogspot.co.uk or phone 07974543123 or 01942 676741.